Asia is criss-crossed with many of the world’s major rivers and boats are an authentic way to travel. These rivers are the ancient lifeblood of the communities and cultures that have developed on their banks. Dramatic scenery, lush deltas, the hustle and bustle of trade plying the waters, all still evident today. Many of Asia’s highlights are best accessed by boat: whether it be the Yangtze’s Three Gorges in China, Vietnam’s lush Mekong delta or the 4,000 Islands of Laos. With the best of both worlds it is possible to step ashore to experience the vibrancy and colour of local life and whilst on-board watch the world go by from the seclusion of your room. Beginning the journey in Vietnam’s bustling metropolis of Ho Chi Minh, it is not long before the modern world is left far behind, replaced with the timeless floating villages and remote Buddhist monasteries along the Mekong River. 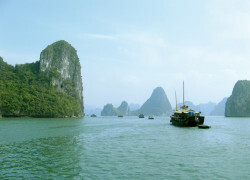 Experience the tributaries and canals, floating markets and island villages, the lifeblood of Indochina. Explore traditional Khmer villages and pre-Angkorian temples and discover the cultural and historical sights before re-emerging into the historical and exotic capital of Phnom Penh. Cruise the Tonle Sap Lake where wildlife flourishes amongst ancient flooded forests with sightings of rare birds and turtles possible. Finally arriving Siem Reap, be amazed at a true wonder – the largest religious monument in the world, Angkor Wat.